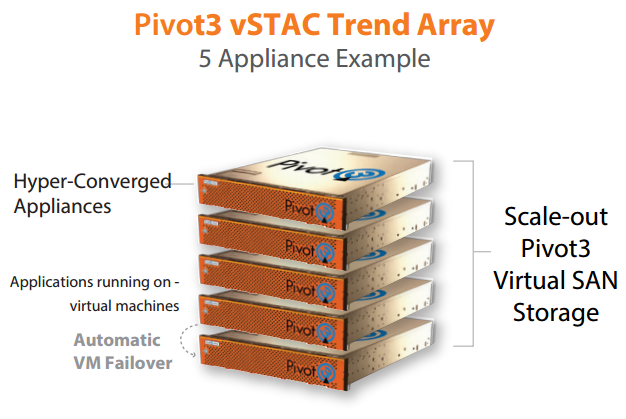 vSTAC Trend appliances deliver globally hyper-converged (GHCI) compute and storage resources that scale as appliances are “stacked” in a Pivot3 virtual storage and compute array. Each vSTAC Trend appliance includes a high-performance VMware ESXi virtual server environment which allocates cross-cluster compute resources to surveillance applications. Pivot3 vSTAC OS pools storage resources across the entire hyper-converged array and presents them to the application as a virtual SAN. Each Pivot3 hyperconverged array contains up to twelve vSTAC Trend appliances and can be expanded on the fly without system downtime. Through its advanced infrastructure software, Pivot3 merges all storage capacity across appliances in an array to create a virtual SAN. There is no need for complex SAN knowledge. The entire storage capacity is presented to the surveillance application as a standard storage target. New appliances added to expand the system are automatically load-balanced for capacity, bandwidth and failover as part of the expanded hyper-converged array. Storage resources can be dynamically and automatically scaled on demand, allowing capacity and performance to be logically and physically expanded while applications are running. This enables the system to meet the needs of even the most demanding surveillance environments. vSTAC OS simultaneously runs VMS archiving applications in virtual server environments. It creates, protects and load-balances IP SAN capacity and performance across HDDs, SSDs, and network and storage bandwidth across the array. Each hyper-converged array is self-healing for drive failures and supports automatic VM restarts using the patented Pivot3 VM Failover technology. Hybrid failover configurations using VMS partners and VMware are also supported. Surveillance HCI nodes combine compute and scale-out storage resources in a single node that saves up to 40% in power, cooling costs and rack space compared to separate servers and storage.